There was a little hatch giving access to the whisky and I bent down to breath in the scent. “Arghh!” I leapt back in shock. My nose had never suffered such an assault. It felt like someone had fired a blow torch up it. The burning sensation remained with me for several more minutes as I continued the rest of the distillery tour. The guide chuckled, knowing that the liquid in this container, the washback, is fermented and the smell provides a fright to all who dare to give it a go. At this stage the whisky has still to go through the distillation process. It is a far cry from the fresh and light drink, with hints of lemon, that I sampled at the end of the tour. The great thing about Scotland is that the countryside is never far away and I soon arrived at a rustic stone wall with chickens in a pen on the other side. I was on a road with muddy tractor tracks, fields with hay bales and sturdy farmhouses. The birdsong was now loud enough to sooth the sound of traffic from the nearby A1, the road that connects Edinburgh with London. I turned onto the Pencaitland Railway path, a traffic-free route along the old Gifford and Garvald Light Railway, which closed in 1965. Tree branches on either side of the path stretched out like hundreds of fingers to touch each other and create a tunnel effect. The trains that once puffed, chugged and rattled beneath these branches had carried Glenkinchie whisky to market. Clydesdale dray horses carted the barrels from the distillery to the station. Sometimes when the barrels were loaded onto the train they rolled across the floor and burst open. This may not have always been an accident as masses of people would suddenly appear with cups to collect the precious liquid. There is not much sign of the railway nowadays, apart from one surprising survivor. There is an old signal post which still has a ladder and looks as good as new with its fresh black and white paint. "There was always a lot of rabbits on the banking. Sometimes the driver would throw coal at the rabbits. We used to collect the coal and take it down to oor mother- ken, for the coal fire. That kept you in the good books with her and you maybe got an extra spoon o' custard!" Quotation on one of the 'Memory Stations' that are along the Pencaitland railway path. There are information panels along the route with stories from locals which helped me to imagine the railway’s heyday. My favourite was about the children who regularly put a half penny on the rail for the train to flatten it. The splattered coin then looked as big as a penny, so they would take this “penny” to the shop and try to buy ice-cream. I also read about a train guard who looked like an old school railwayman with his hat and hairy moustache and was a stickler for timekeeping, but enjoyed heading to the pub as soon as his shift was over. These disused railways are a joy for cyclists, but I find it sad that the trains have gone as they had been such an important feature of community life. A positive aspect is that these paths are now a haven for nature. I spotted a little bull finch jumping form branch to branch, singing away. I watched him for a few minutes whilst he went about his merry business, his head turning occasionally in my direction just to make sure I was not a threat. There are vistas of the surrounding farmland, which look indistinguishable from many parts of Scotland, but these are very special fields. East Lothian is one of the most fertile areas in the country for agriculture. It provides highly prized cereals, fruit, vegetables, beef and lamb. It has more hours of sunshine and less rainfall than any other Scottish region. It is this land and climate that provides Glenckinchie whisky with its distinctive character which is softer, drier and milder than malt from other regions. I left the railway path to make the final approach to the distillery along a hedge-lined road punctuated by oak trees soaring skywards. I passed a a red phone box and a gathering of single-storey cottages with the scent of wood burning fires. These stone buildings with their small windows and steep roofs had been provided for the distillery workers as rent-free accommodation. My bicycle was the only one in the distillery car park which made me feel a little conspicuous. This is mainly a driving destination, a place to come for a half-day from Edinburgh, so it was unsurprising that the other visitors watched me with interest. However, the tour guide was used to seeing cyclists and told me, "once we had this guy who cycled to every distillery in Scotland. I think Glenkinchie was the last one he came to". There is something magical about a distillery tour. You are entering a secret world of sweet and earthy aromas, heat and copper machinery. You are seeing a process that has little changed in over 150 years. "Glenkinchie is known as the breakfast whisky," the guide smiled. "This is because it has a lighter character and is easier to drink than other malts." The very idea of drinking whisky for breakfast could only be Scottish! I could not imagine having it with my cornflakes, but somebody somewhere must have done this to bring about this nickname. The tasting room is kitted out with a bar where I was encouraged to sample and compare whiskies from each region. It was tempting to stay in that dark and warm room instead of going back out into the cold, but I restricted myself to one glass so that I could be safely in charge of my bicycle. It was tough to get back on the saddle after being cocooned inside the distillery and it took me a while to get into the rhythm. I arrived at the village of West Saltoun, but it can hardly be called a village as it is basically a row of cottages. I noticed that one of them is called "Old Bakehouse" and wondered if locals had once queued here for their morning rolls. There was smoke coming out of the chimney and it was dancing in the gentle breeze. I could smell that it was wood smoke, but my imagination was telling me "scones". One mile further on is East Saltoun which is larger with a shop, school and church with Gothic steeple. I arrived to hear two chimes from the clock tower. It was not a booming bell, more like a mantlepiece clock in a drawing room where you could imagine genteel folk taking tea and playing bridge. I thought this was an appropriate sounding clock for such a peaceful village. There is a fountain made of portland stone that has an angel on the top. The inscription reads "in loving memory of John Fletcher of Saltoun born at Saltoun February 7 1827 and died there January 17 1903. He was beloved by all on his estate. This fountain is erected by his devoted wife Bertha." I was touched that this man had made such an impression that his wife had commissioned this memorial. It is not something that happens nowadays. The final leg of my journey took me on another disused railway that once connected Longniddry to Haddington. This 4.8 mile line had been operational until 1968. I had fun with the information panels in the style of signal posts, where you pull out the post to read about the wildlife that has settled here now that the iron and steam have long gone. However, the little creatures may need to look for a new home as there is an active campaign to have this line reopened because of the growth in population of Haddington. Longniddry still has a working station, so I was able to board a train to Edinburgh and get my nose back home for some serious R&R. 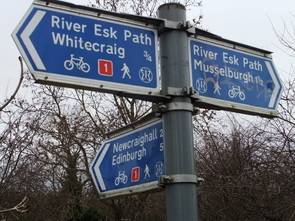 The train to Musselburgh from Edinburgh Waverley takes only 6 minutes, so this is an ideal cycling day trip from Edinburgh. The route ends at Longniddry station where it takes about 20 minutes on the train to get back to Edinburgh. The total distance is around 24 miles. This route has two traffic-free sections on disused railway lines, which are totally flat. The rest of the route is on quiet country roads where there is hardly any traffic, but some minor hills. This ride is a good choice if you are new to cycling. Glenckinchie distillery has a visitor centre, shop and tours that take around one hour and 15 minutes. There are information panels along both disused railway paths telling the history of the lines. This can be done as a day trip from Edinburgh. I would recommend bringing your own food as, despite the closeness to the capital city, this is a rural area with few options to pick up supplies.